Charles Perrault (French: [ʃaʁl pɛʁo]; 12 January 1628 – 16 May 1703) was a French author and member of the Académie Française. He laid the foundations for a new literary genre, the fairy tale, with his works derived from earlier folk tales. The best known of his tales include Le Petit Chaperon Rouge (Little Red Riding Hood), Cendrillon (Cinderella), Le Chat Botté (Puss in Boots), La Belle au bois Dormant (The Sleeping Beauty) and Barbe Bleue (Bluebeard). Some of Perrault's versions of old stories have influenced the German versions published by the Brothers Grimm more than 100 years later. The stories continue to be printed and have been adapted to opera, ballet (such as Tchaikovsky's The Sleeping Beauty), theatre, and film. 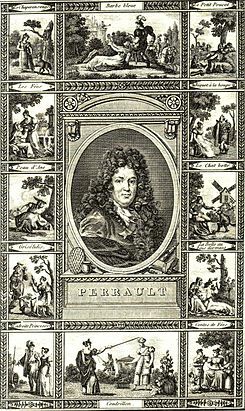 Perrault was an influential figure in the 17th-century French literary scene, and was the leader of the Modern faction during the Quarrel of the Ancients and the Moderns. Perrault was born in Paris to a wealthy bourgeois family, the seventh child of Pierre Perrault and Paquette Le Clerc. He attended very good schools and studied law before embarking on a career in government service, following in the footsteps of his father and elder brother Jean. He took part in the creation of the Academy of Sciences as well as the restoration of the Academy of Painting. In 1654, he moved in with his brother Pierre, who had purchased the position of chief tax collector of the city of Paris. When the Academy of Inscriptions and Belles-Lettres was founded in 1663, Perrault was appointed its secretary and served under Jean Baptiste Colbert, finance minister to King Louis XIV. Jean Chapelain, Amable de Bourzeys, and Jacques Cassagne (the King's librarian) were also appointed. Using his influence as Colbert's administrative aide, he was able to get his brother, Claude Perrault, employed as designer of the new section of the Louvre, built between 1665 and 1680, to be overseen by Colbert. His design was chosen over designs by Gian Lorenzo Bernini (with whom, as Perrault recounts in his Memoirs, he had stormy relations while the Italian artist was in residence at Louis's court in 1665) and François Mansart. One of the factors leading to this choice included the fear of high costs, for which other architects were infamous, and second was the personal antagonism between Bernini and leading members of Louis's court, including Colbert and Perrault; King Louis himself maintained a public air of benevolence towards Bernini, ordering the issuing of a royal bronze portrait medal in honor of the artist in 1674. As Perrault further describes in his Memoirs, however, the king harbored private resentment at Bernini's displays of arrogance. The king was so displeased with Bernini's equestrian statue of him that he ordered it to be destroyed; however, his courtiers prevailed upon him to have it redone instead, with a head depicting the Roman hero Marcus Curtius. In 1668, Perrault wrote La Peinture (Painting) to honor the king's first painter, Charles Le Brun. He also wrote Courses de tetes et de bague (Head and Ring Races, 1670), written to commemorate the 1662 celebrations staged by Louis for his mistress, Louise-Françoise de La Baume le Blanc, duchesse de La Vallière. Perrault was elected to the Académie française in 1671. He married Marie Guichon, age 19, in 1672; she died in 1678. In 1669 Perrault advised Louis XIV to include thirty-nine fountains each representing one of the fables of Aesop in the labyrinth of Versailles in the gardens of Versailles. The work was carried out between 1672 and 1677. Water jets spurting from the animals' mouths were conceived to give the impression of speech between the creatures. There was a plaque with a caption and a quatrain written by the poet Isaac de Benserade next to each fountain. Perrault produced the guidebook for the labyrinth, Labyrinte de Versailles, printed at the royal press, Paris, in 1677, and illustrated by Sebastien le Clerc. Philippe Quinault, a longtime family friend of the Perraults, quickly gained a reputation as the librettist for the new musical genre known as opera, collaborating with composer Jean-Baptiste Lully. After Alceste (1674) was denounced by traditionalists who rejected it for deviating from classical theater, Perrault wrote in response Critique de l'Opéra (1674) in which he praised the merits of Alceste over the tragedy of the same name by Euripides. This treatise on Alceste initiated the Quarrel of the Ancients and the Moderns (Querelle des Anciens et des Modernes), which pitted supporters of the literature of Antiquity (the "Ancients") against supporters of the literature from the century of Louis XIV (the "Moderns"). He was on the side of the Moderns and wrote Le Siècle de Louis le Grand (The Century of Louis the Great, 1687) and Parallèle des Anciens et des Modernes (Parallel between Ancients and Moderns, 1688–1692) where he attempted to prove the superiority of the literature of his century. Le Siècle de Louis le Grand was written in celebration of Louis XIV's recovery from a life-threatening operation. Perrault argued that because of Louis's enlightened rule, the present age was superior in every respect to ancient times. He also claimed that even modern French literature was superior to the works of antiquity, and that, after all, even Homer nods. In 1682, Colbert forced Perrault into retirement at the age of 56, assigning his tasks to his own son, Jules-Armand, marquis d'Ormoy. Colbert would die the next year, and Perrault stopped receiving the pension given to him as a writer. Colbert's bitter rival succeeded him, François-Michel le Tellier, Marquis de Louvois, and quickly removed Perrault from his other appointments. After this, in 1686, Perrault decided to write epic poetry and show his genuine devotion to Christianity, writing Saint Paulin, évêque de Nôle (St. Paulinus, Bishop of Nola, about Paulinus of Nola). Just like Jean Chapelain's La Pucelle, ou la France délivrée, an epic poem about Joan of Arc, Perrault became a target of mockery from Nicolas Boileau-Despréaux. Charles Perrault died in Paris in 1703 at the age of 75. On 12 January 2016 Google honoured him with a doodle by artist Sophie Diao depicting characters from the Tales of Mother Goose (Histoires ou contes du temps passé). In 1695, when he was 67, Perrault lost his position as secretary and decided to dedicate himself to his children. In 1697 he published Tales and Stories of the Past with Morals (Histoires ou Contes du Temps passé), subtitled Tales of Mother Goose (Les Contes de ma Mère l'Oye). (The spelling of the name is with "y" although modern French uses only an "i".) This "Mother Goose" has never been identified as a person, but used to refer to popular and rural storytelling traditions in proverbial phrases of the time. (Source : Dictionnaire de l'Académie, 1694, quoted by Nathalie Froloff in her edition of the Tales (Gallimard, Folio, Paris, 1999.- p. 10).) These tales, based on French popular tradition, were very popular in sophisticated court circles. Its publication made him suddenly very widely known and he is often credited as the founder of the modern fairy tale genre. Naturally, his work reflects awareness of earlier fairy tales written in the salons, most notably by Marie-Catherine Le Jumel de Barneville, Baroness d'Aulnoy, who coined the phrase "fairy tale" and wrote tales as early as 1690. Some of his popular stories, particularly Cinderella and The Sleeping Beauty, are still commonly told similar to the way Perrault had written them, while others have been revised over the years. For example, some versions of Sleeping Beauty published today are based partially on a Brothers Grimm tale, Little Briar Rose, a modified version of the Perrault story, but the Disney version is quite true to the original Perrault tale. Perrault had written Little Red Riding Hood as a warning to readers about men who were trying to prey on young girls who were walking through the forest. He provided the following comment about the morality or lesson provided by the story. "I say Wolf, for all wolves are not of the same sort; there is one kind with an amenable disposition – neither noisy, nor hateful, nor angry, but tame, obliging and gentle, following the young maids in the streets, even into their homes. Alas! Who does not know that these gentle wolves are of all such creatures the most dangerous!" Indeed, the girl gets into bed with the wolf and is devoured. There is no happy ending as in most current versions of the story. He had actually published his collection under the name of his last son (born in 1678), Pierre (Perrault) Darmancourt ("Armancourt" being the name of a property he bought for him), probably fearful of criticism from the "Ancients". In the tales, he used images from around him, such as the Chateau Ussé for The Sleeping Beauty, and the Marquis of the Château d'Oiron as the model for the Marquis de Carabas in Puss in Boots. He ornamented his folktale subject matter with details, asides and subtext drawn from the world of fashion. Following up on these tales, he translated the Fabulae Centum (100 Fables) of the Latin poet Gabriele Faerno into French verse in 1699. ^ Morgan, Jeanne (1985). Perrault's Morals for Moderns. New York, Berne, Frankfurt am Main: Peter Lang Publishing Inc. ISBN 0820402303. ^ Sideman, B. B.: "The World's Best Fairy Tales", page 831. The Reader's Digest Association, 1967. ^ For the conflict between Bernini and Perrault in Paris, see Mormando, Franco (2011). Bernini: His Life and His Rome. Chicago: University of Chicago Press. pp. 268–288. ISBN 978-0-226-53852-5. ^ Mormando, Franco (2011). Bernini: His Life and His Rome. Chicago: University of Chicago Press. pp. 245–288, passim. ISBN 978-0-226-53852-5. ^ Zarucchi, Jeanne Morgan (2013). "Perrault's Memoirs and Bernini: A Reconsideration". Renaissance Studies. 27:3: 356–70. ^ The engraving is derived at more than one remove from the portrait of 1671, now at the Musée de Versailles, by an unknown artist. ^ "scan of the book at the Bibliothèque nationale de France". Gallica.bnf.fr. 15 October 2007. Retrieved 24 March 2014. ^ Quinault, Philippe (1994). Brooks, William; Norman, Buford; Zarucchi, Jeanne Morgan (eds.). Alceste suivi de La Querelle d'Alceste. Geneva: Droz. ISBN 2600000534. ^ "Charles Perrault's 388th Birthday". Google Doodle. Google Inc. 12 January 2016. Retrieved 12 January 2016. ^ Neil, Philip; Nicoletta Simborowski (1993). The Complete Fairy Tales of Charles Perrault. Houghton Mifflin Harcourt. p. 126. ISBN 0-395-57002-6. ^ Flood, Alison (12 January 2016). "Charles Perrault: the modern fairytale's fairy godfather". The Guardian- Books. The Guardian. Retrieved 12 January 2016. The stories...might have been old, but what he did with them was new. ^ Jasmin, Nadine (2002). Naissance du conte féminin, Mots et merveilles, Les contes de fées de Madame d’Aulnoy, 1690-1698. Paris: Champion. ISBN 2-7453-0648-0. ^ "The many versions of Cinderella: One of the most ancient fairy tales". Swide Art & Culture. Dolce&Gabbana. 21 February 2015. Retrieved 12 January 2016. The famous fairy tale of Cinderella is best known from the film made by Walt Disney in 1950, which in turn is based on the story penned by Charles Perrault. ^ Williams, Rhiannon (12 January 2016). "Who was Charles Perrault? Why the fairy tales you know may not be as they seem". The Telegraph. London, England. Retrieved 12 January 2016. ^ "Little Red Riding Hood Charles Perrault". Pitt.Edu. University of Pittsburgh. 21 September 2003. Retrieved 12 January 2016. And, saying these words, this wicked wolf fell upon Little Red Riding Hood, and ate her all up. ^ Collin, F. (1999). Charles Perrault, le fantôme du XVIIe siècle. Draveil, Colline. ISBN 2-9513668-0-9. Zarucchi, Jeanne Morgan (2013), "Perrault's Memoirs and Bernini: A Reconsideration," Renaissance Studies, Vol. 27, Issue 3, pp. 356-70. Herbermann, Charles, ed. (1913). "Charles Perrault" . Catholic Encyclopedia. New York: Robert Appleton Company.